Traefik is modern HTTP reverse proxy and load balancer for microservices. Traefik makes all microservices deployment easy, integrated with existing infrastructure components such as Docker, Swarm Mode, Kubernetes, Amazon ECS, Rancher, Etcd, Consul etc. 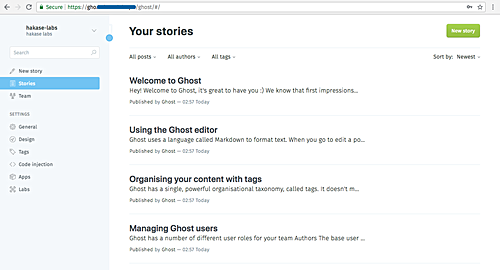 In this tutorial, we will show step-by-step how to install and configure Ghost as a Docker container. 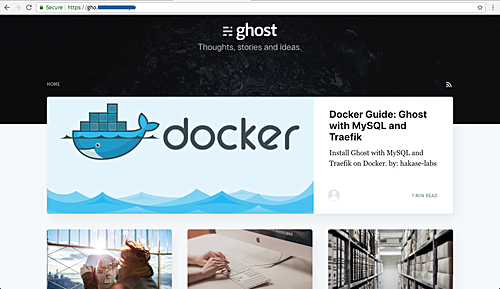 We will install and configure Ghost under the latest Docker CE version, use the MySQL as a database and use the Traefik as a Reverse Proxy. The first step we will do in this tutorial is to install the latest docker-ce version of the system. The docker-ce version can be installed from the official docker repository. Add the docker key and docker-ce repository. The command will automatically update all repositories on the system. Now install docker using the apt command below. 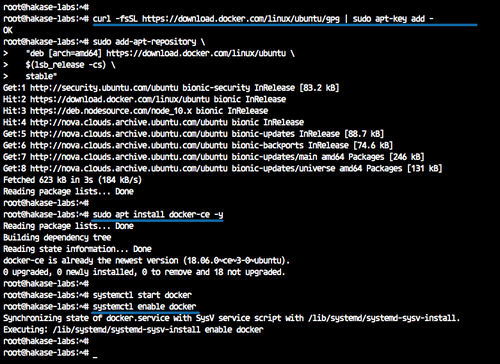 After the installation is complete, start the docker service and enable it to launch every time at system startup. The latest docker-ce version has been installed on the Ubuntu 18.04 system. In this guide, all container microservices will be run under the normal/non-root user. So we need to configure the user to be able to run the Docker container and run the sudo command for root privileges. 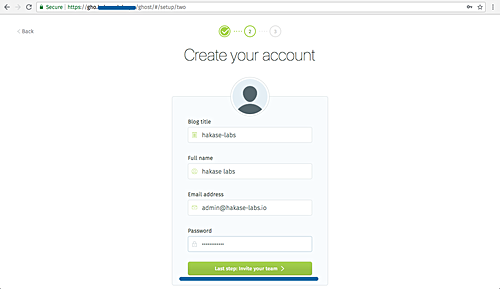 Create a new user named 'hakase' and create the password. Now assign the 'hakase' user to the 'sudo' and 'docker' groups. And restart the docker service. 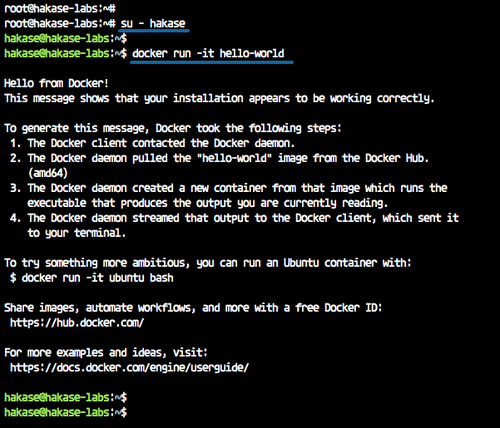 The 'hakase' can now run the docker container and run the sudo command for root privileges. Login as user 'hakase' and run the docker hello-world container. And following is the result. In this tutorial, we will install the docker compose 1.21 from a binary file on Github repository. Download the docker-compose binary to the '/usr/local/bin' directory. And make the 'docker-compose' file executable by changing the file permission. The docker compose has been installed - check it using the command below. 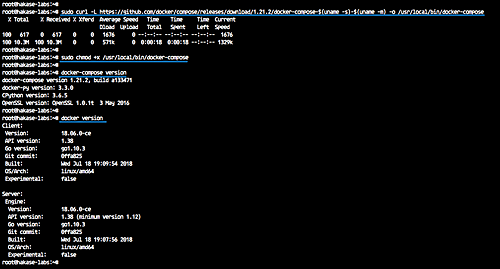 Docker-compose 1.21 with Docker-ce 1.18 has been installed. 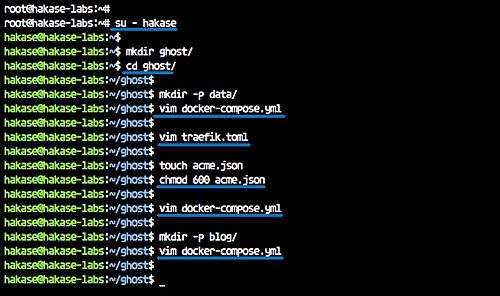 In this step, we will configure the docker and create a new docker-compose file for the ghost installation. We will create a new docker custom network and create a new docker-compose yml file that contains three main services, including MySQL database, Traefik reverse proxy, and Ghost blog itself. Show the available docker network using docker network command below. 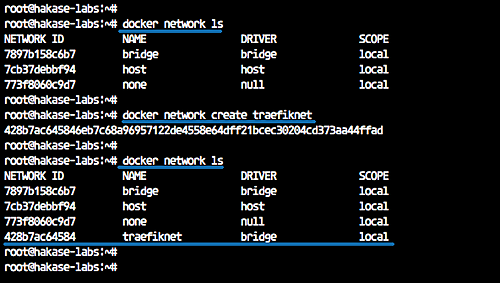 Create a new custom docker network for the traefik reverse proxy named 'traefiknet'. Now check again the available network on the docker system. The custom network for Treafik named 'traefiknet' has been created. After creating the docker custom network, we will create a new project directory named 'ghost' and create a new docker-compose.yml file. Login to the 'hakase' user. 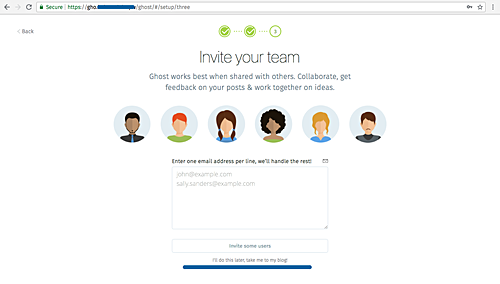 Create a new 'ghost' directory and change the working directory to it. And create a new docker-compose file. MySQL is the first service we want to create, and we want to create the MySQL container with configurations below. We will be using the MySQL 5.7 docker image. Mount the MySQL data directory to the local docker host directory. Running the MySQL service on the local internal network. Configure MySQL user and password. The MySQL container will be named as 'mysql'. Inside the 'ghost' directory, create a new directory named 'data' and edit the 'docker-compose.yml' file. After creating the MySQL service, we will create and configure the traefik reverse proxy container. Before editing the 'docker-compose.yml' script, we need to create a new traefik configuration named 'traefik.toml'. Paste traefik rule configuration below. Now we need to create a new file for the SSL Letsencrypt configuration 'acme.json'. It's used to store all letsencrypt generate a log. Create the blank 'acme.json' file and change the permission to 600. Next, we will edit the 'docker-compose.yml' script and add the traefik service configuration. We will be using the latest traefik docker image. It's used the custom network 'traefiknet', and expose the HTTP and HTTPS ports. 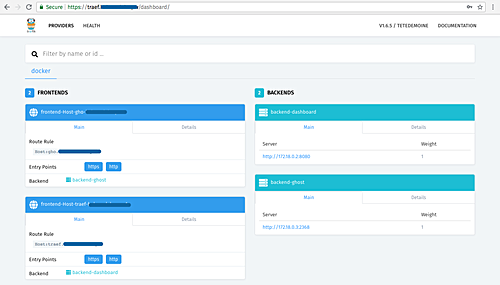 We defined the traefik dashboard URL and backend through the docker labels. Paste the traefik service configuration below. After configuring the traefik reverse proxy, we will create the main ghost service configuration. Configuration details that we want to create. We will be using the ghost v1 and the small docker alpine version. We will mount the ghost content directory to the local directory named 'blog'. 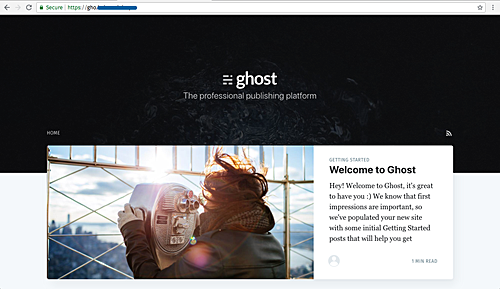 The ghost service will be running on the default port with the domain name 'gho.hakase-labs.io', the configuration through docker labels. The ghost service will be using two docker networks, internal and traefiknet. We're configuring the MySQL database details from the mysql container configuration. 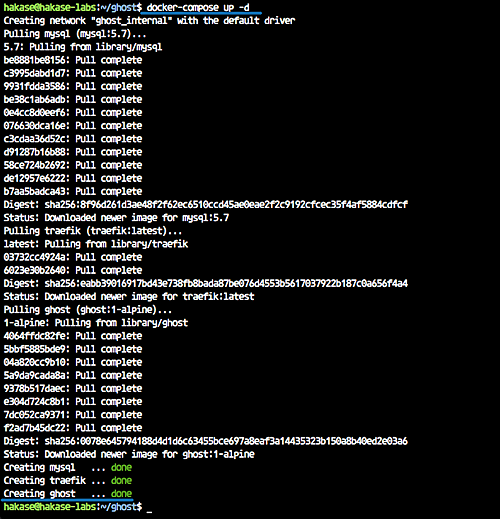 And the ghost will be started when the traefik and MySQL container is up and running. Create a new directory named 'blog' and edit the 'docker-compose.yml' file. And now we got all directory and configuration as shown below. To build and run all our ghost stack service, we can use the command below. When it's complete, check all running services. And the following is the result. If you have an error, check the container log using commands below. The ghost stack with MySQL and the Traefik reverse proxy is up and running. Log in with the user and password on the 'traefik.toml' file. And following is the Traefik dashboard. And you will get the ghost home page. Click the green button to create a new admin user. Type detail user, password, email, and click again the green button. For inviting a new member or user, click the 'I will do this later..' link. Now you will get the Ghost Dashboard. And after creating the sample post, the following is the result. 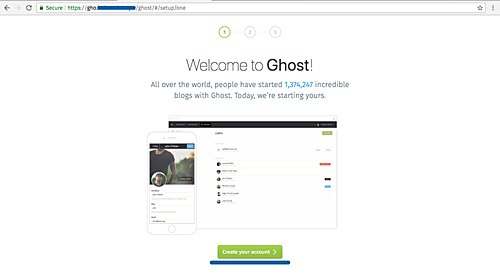 Ghost blog installation with MySQL database and Traefik Reverse Proxy on the Docker environment has been completed successfully. Well, a lot of manipulation in a simple template installation. Maybe I do not understand something, but it was unrealistically difficult, though very informative and detailed.